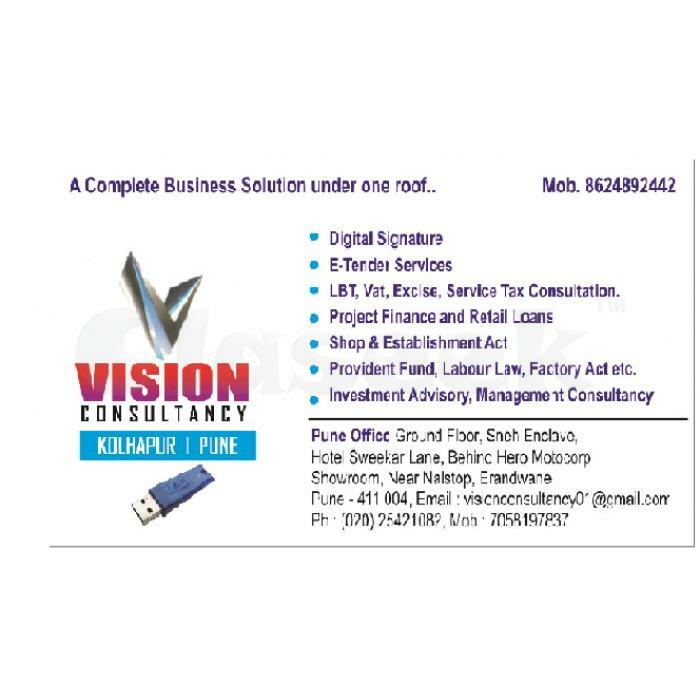 We are Vision Consultancy firm having offices at Kolhapur, Pune and Mumbai. Presently we are providing wide range of services covering direct and indirect tax consultation and many other non-conventional services in a wide geographical area covering almost entire Maharashtra and part of other states like Karnataka, Kerala etc. a) GST, LBT & VAT ​consultation - We are also providing LBT & GST consultation in various cities on Maharashtra such as Pune, PCMC, Kolhapur, Thane, Ulhasnagar, Navi Mumbai etc. Our service covers entire consultation about Local Body Tax which includes registration, computation, consultation, return preparation and representation before tax authorities for various notices and assessment. d) Auditing - Auditing in simple terms is investigating the internal operations in any business. Auditing takes care of the business function. e) Other services - ​We provide all sort of services related to Accounting, Tax Consultancy, Financial services, Trademark registration, Import-Export Code​, ​Shop Act registration ​etc. f) SBI Housing Loan - We are also providing SBI housing Loan Consultation.